Hi Everyone! Di recommended this forum some months ago now. I know Ann here too and some other familiar faces. 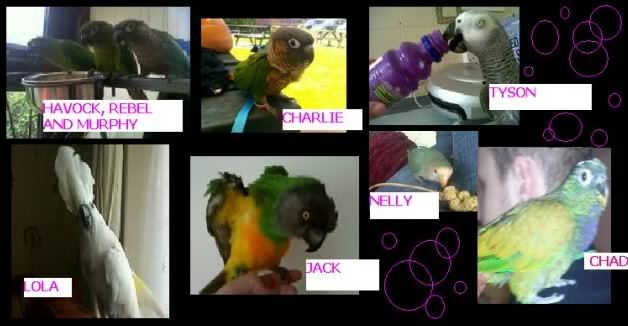 My name is Roz and I live in London with Kobe the Blue-headed Pionus and Ollie the Orange-winged Amazon. Yeaaay!! Hi Roz you found us at last. Aunty Di wants to know how lovely Kobe and Ollie Malone are?? Welcome to the forum Roz! Beautiful pics, especially Kobe! Hiya Roz and of course Ollie and Kobe! You will have to post some of your stunning pics of the boys! Lovely to see you here, welcome to the forum! roz ive missed my fix of pics of ollie and kobe. Hello Everyone! I know a lot more of you than I thought I did! Kobe and Ollie say "Hello" to their Aunty Di! You would be correct in that Kobe is still a poser... and Ollie is turning out to be the sweetest thing ever! Hi Scarlett! The java tree is inching slowly towards Ollie! It's beautiful! Hi Shell and thank you for the lovely comments about Kobe and Ollie. Your Macaws look amazing! Haha, Hollie, I know why you like Kobe after seeing Chad in your siggy! Can't wait to 'meet' him! Hi Michelle - you and your flock are here too! Hafta say all the Greys in your sig make me smile! Hi Margy! Your flock look amazing in your siggy! Ollie is doing wonderfully - I see the tiniest bits of progress every day. Hello te-parrots and thanks for the welcome. everything is great cannot call myself ericsmum as the flock has really grown. ive even got a white head pionus named jake and he is settling wonderfully . parrotmum wrote: everything is great cannot call myself ericsmum as the flock has really grown. ive even got a white head pionus named jake and he is settling wonderfully . Ah ha - thought it was you... I thought I recognised the garden in your avatar... although it's very small!... er the pic not your garden! I love White-caps - their colours are amazing - especially under the wings! You'll have to tell me more about him.